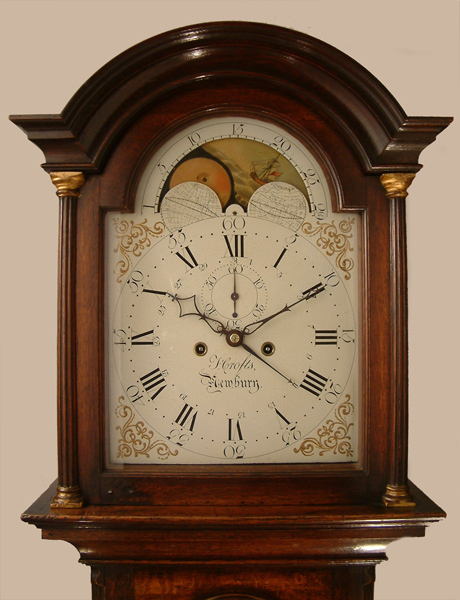 Thomas Crofts of Newbury Longcase Oak Circa 1785 - Height 83.7in. This Longcase Oak Archive's Maker - T ( Thomas ) Crofts of Newbury is recorded - a single date 1790 and as a member of the Clockmakers Company. Very good, late18C, long door, oak case with breakarch top, quarter sawn, boxwood and ebony strung, mahogany crossbanded oak trunk door, "pillars attached" hood door and canted, fluted trunk corners all set on double plinth base.Good colour and patination. 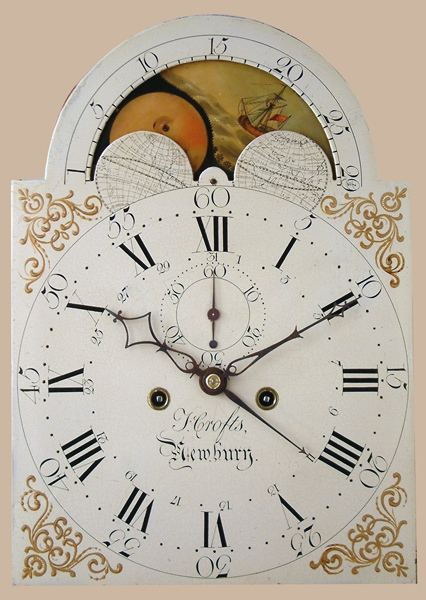 12" breakarch early "Osborne" painted dial with moonphases to arch, raised gilt gesso corner spandrels, subsidiary seconds dial, centre sweep date indicator, and "minutes numbered" to outer chapters. Blued cut steel hands ( 4 ). High quality 5 pillar movement, hourly ( rack ) striking on a single bell.High quality gear and double pin moondrive.Very well executed wheelwork. T ( Thomas ) Crofts of Newbury is recorded - a single date 1790 and as a member of the Clockmakers Company. 83.7" ( 213 cms. ).